I’ve been brainstorming plants to climb up my willow obelisk. My first thought was to do morning glories. After reading all your lovely comments and suggestions I’m now moving towards Clematis. I was flipping through the new Martha Stewart Living featuring a few clematis plants. The dark purple was gorgeous. Might be stunning against a gray house with pink and green plants surrounding it. The pink version combined with a rose on the right is pretty amazing too. A few more clematis inspiration shots below from White Flower Farm. If you decide on a clemetis, I recommend you purchase the biggest plant you can get at a local nursery. I have many in my garden and the smaller plants are difficult to get established and can take a good 3 years to really produce. I have lost several and it can be heartbraking. Why not plant both clematis and morning glory together. Choose a variety of clematis that can be cut down to the ground, plant some morning glory seedlings around its base and enjoy the best of both worlds. You will also have continuous blooms…I have to say though, I usually grow clematis up large trellises or arches – it can be very rambunctious…almost wisteria like if it is happy…. Clematis is my favourite, I have a white one and after it lies dormant all winter it is covered in a blanket of blossoms in the spring, pure heaven! there is a clematis in my neighborhood with white flowers that are the size of my head. stunning! I've been thinking of making a "willow" obelisk out of small gauge re-bar and steel wire– it would be sturdy enough to handle any vine, and would withstand winter outside, which would give a garden a good sculptural presence in the dead of winter. I think it would patina well as it developed a little rust. I think the blue/pink clematis/rose combo is gorgeous. 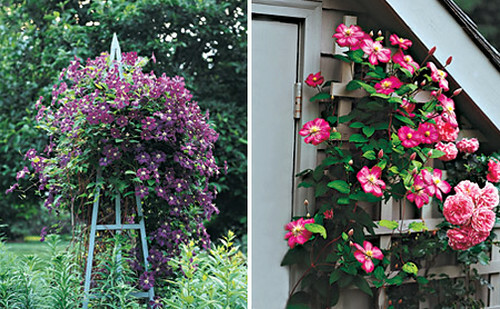 My favorite combination is a deep purple clematis paired with a pink rose like the Eden climber. Both do very well. I have mine in containers! yes!!! i am in love with the white bloom with the purple center. Cicada sounds like she knows what she's talking about, go with her! Can't wait to see what you do! for me, nothing beats passiflora. she climbs like a maniac with the curliest tendrils. and the blooms…oh the blooms. so plentiful and other-wordly. i'm an addict. I adore clematis… I would be a bit concerned that the perennial might really overtake the willow obelisk- it's got a woody stem that, depending on the variety you get may not be able to cut down to the ground. The obelisk, being left out season after season will most likely begin to buckle from the weight as clematis is a vigorous, heavy and twisty grower and has pulled down a trellis and a lightweight steel archway in my own yard. Morning glories, sweet peas, moon flower- any annual vine, might be better and you can winter the obelisk in the safety of a garage. Another nice perennial vine is honeysuckle- it's also woody, but isn't as "grabby", so it can be trained a bit easier.